Equations that lead to the Bulls chance to win a Championship use advanced metrics. The questions is, do you think the Bulls have enough experience to win the title? Do you think that's even relevant? Sports fans are typically characterized as impatient, and in most sports they have a right to be. Football, baseball and hockey have all had surprise champions in the past decade, if not the past few decades. You can even link this trend to major college sports, although calling anything a “surprise” when the primary participants are between 18 and 22 seems like a stretch. Yet the NBA is one professional sport where surprises rarely happen. Pecking order, pain and suffering, and experience seems to be the keys to winning a championship. In theory, none of those things should matter. Win-Loss records will tell you this year’s Chicago Bulls are one of the two best teams in the NBA. Advanced metrics will tell you they are the best team in the NBA with the best chance to win the title. And for statistical skeptics and old-school scouts, the eye test will tell you the Bulls have been playing the best basketball in the league since the All-Star break. So shouldn’t Chicago Bulls fans think their team has a legitimate shot to win the NBA championship? History says no. Go all the way back to 1980 and you’ll find two teams in those 30 years that have won a title without winning a single playoff series the year before: The 1982 Lakers and the 2008 Celtics. It’d be easy to make arguments for why those two teams weren’t really outliers — the Lakers had won the title in 1980, so they knew what it took to win; the ‘08 Celtics were comprised of three star players that had all come close to reaching the Finals with other teams during the 2000’s — but from a purely “if no playoff success the previous year equals no championship the next” theory, then those two teams are the ones that stand out. If you’re a Bulls fan — and by that we mean a fan who followed this team at least the last few years — you’re aware the Derrick Rose era has seen the Bulls amass zero playoff series wins. If you’re an older Bulls fan who vividly remembers all great teams from the 1990s, you’re aware that the Bulls lost several times in the Eastern Conference finals to the Detroit Pistons before breaking through to win the championship. Many thought the struggles against the Pistons lead to the ‘90s Bulls becoming championship caliber. This type of struggle and then breakthrough in the NBA has become the norm for championship teams. This type of struggle and then breakthrough has not occurred for the current edition of the Chicago Bulls. Charles Barkley recently said the idea of the Bulls not having the proper experience and past heartbreak is “stupid.” He noted the additions of Carlos Boozer and coach Tom Thibodeau, plus having Derrick Rose — who clearly went from good to great this year — makes this current Chicago team much different than the last two. Once again, in theory, he’s correct. Last year’s Bulls team was the last team in the team in the Eastern playoff picture, this year they are the top seed. They made “the leap” to one of the NBA’s elite teams this year, so why should their championship chances be linked to not having their hearts broken during a title quest? While history says it does matter, Bulls fans probably aren’t all that afraid of the teams that stand in Chicago’s championship path. The Bulls main competition to reach the NBA Finals is the Boston Celtics, Miami Heat and Orlando Magic. It’s hard to predict who the Bulls would play in the NBA Finals if they reached it, but many experts are picking the LA Lakers. Out of all those teams just mentioned, only the Heat didn’t make the Finals in the last three years, and only the Heat and Magic haven’t won a title in the last three years. Lately, the Bulls look better than all those teams. They’d have homecourt advantage against any of them. They seemingly have many things in their favor, except history and the fairly true NBA adage about enduring the proper amount of playoff suffering before a championship can be won. Still, as advanced statistical metrics have become increasingly popular, that NBA adage seems to be one those things is only true because of coincidence. It isn’t statistically relevant, especially to the advanced metrics community. 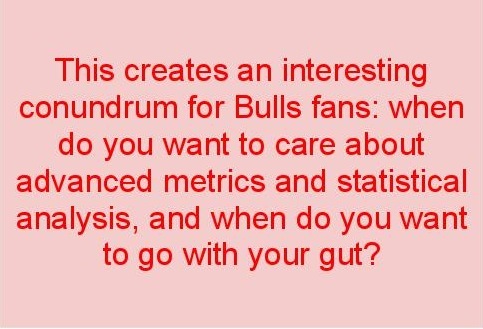 Of course, Bulls fans haven’t been all that fond of the advanced metrics community. ESPN’s statistic guru John Hollinger has been saying all year that advanced stats show Derrick Rose is not the MVP — Bulls fans, NBA fans, and the majority of the media have routinely disagreed with his assessment. Rose-for-MVP advocates look way past his stats to make their case: they point out his leadership, his clutchness, his ability to carry the team when other guys were (and continue to be) hurt. If you believe in that stuff, you might not put much stock in newfangled stats that measure efficiency or “win share.” And yet, Hollinger’s advanced team stats — which could give a crap about unmeasurable things like chemistry — say the Bulls are the best and the favorites to win the title, even when popular NBA wisdom says this team is at least one year away from being a championship team. 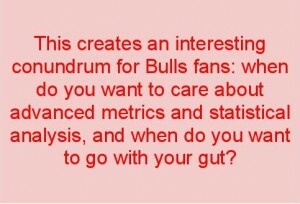 This creates an interesting conundrum for Bulls fans: when do you want to care about advanced metrics and statistical analysis, and when do you want to go with your gut? Can you use modern, math-heavy stats to convince yourself that the Bulls should win the title, while dismissing those same stats to argue that Derrick Rose is clearly the MVP? Of course you can. Sports fans can be characterized in many different ways, but one thing is certain: they will use any argument to justify why their teams and their players are the best, even if those arguments seem to contradict one another.